Efficient use of valuable space. 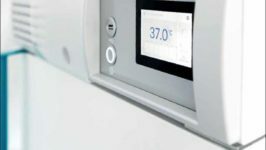 Learn how the HettCube series incubators and cooled incubators will benefit your laboratory workflow. Cabinet available for HettCube 200 and HettCube 200 R models. The Hettich Tray System, which fits in all three incubator sizes, allows the internal space of the HettCube to be used optimally. Stainless steel shelf with 81 piece capacity. HettCube models come complete with an extensive list of standard equipment. Our intuitive touchscreen offers many features providing optimal flexibility and user control. Below are resources to help you get familiar with HettCube line of incubators.